Milan (TheUltimateDesign) presented us with an amazing model and quite different for awhile. An old Tow Truck based on the Russian truck Zil Amo F15. 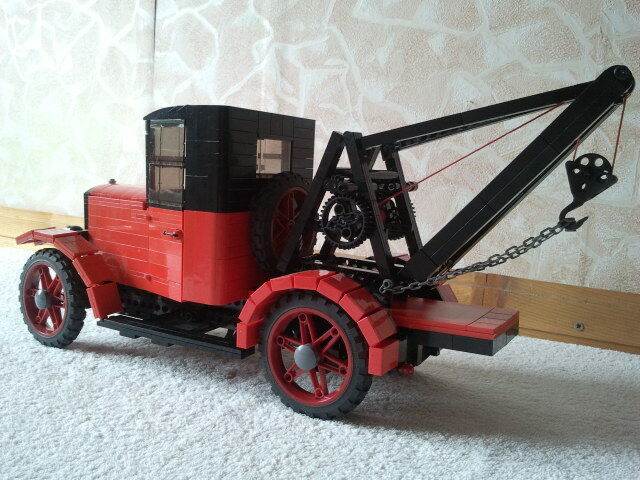 It is amazing how the original forms and angles from this old truck, were preserved into this LEGO recreation. It includes two PF M-motors well hidden inside the chassis. One for drive and another one for steering. Both are controlled from PF Speed Remote Control for a more realistic set of movements. The winch is operated manually from both sides of the truck and has a very nice old style look. For additional photos you should refer to Milan's Brickshelf folder, here. How the hell are the studless plates held together? I believe it is done with hinge plates underneath.